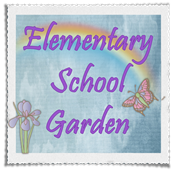 Elementary School Garden: Back to School with BIC - Giveaway! With the new school year finally upon us I thought I would take a little time away from the chaos and share one of my absolute FAVORITE brand of products . . . BiC! 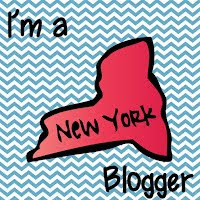 Now, you know I only share with you products that I think are fantastic and that I use in my own classroom and home. So, when BiC contacted me to review some of their products for free a 2nd time I jumped at the offer. BiC's main goal this year is to encourage students to write more often, because writing is by far one of the most important learning tools for a child's academic success. With that in mind, BiC has launched the "Fight for Your Write" campaign to reinforce how fun and empowering writing can be. This campaign comes at a perfect time. For example, our writing block has been removed this school year and there is a strong emphasis on keyboarding skills rather than cursive. Could handwriting disappear from our curriculum? BiC's campaign offers information about writing and tips from literacy expert Pam Allyn to help parents, caregivers, and students make a commitment to write more often. They are advocating for handwriting to remain not only in our classrooms but a big part of a child's home life as well. Now that you are ready to write you need the right tools! BiC's new back-to-school products are sure to make writing fun, inspiring students to confidently express their thoughts through written word. I love BiC Kids Mechanical Pencils. Mechanical pencils are often deemed useless once the lead runs out. However, these not only come with a big eraser but a lead refill with six leads. BiC Kids Pen includes stickers to personalize the pen and comes in purple or green. Now when we find a random pen on the floor students will be able to quickly identify it's correct owner based on the student created design. 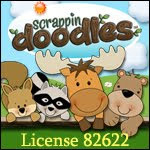 Looking for a child friendly stylus? BiC Kids Stylus is the perfect tool for small hands and will be perfect for navigating our class Kindles. BiC 4-Color is an amazing pen that provides the convenient ability to choose from 4 ink colors at the click of a button . 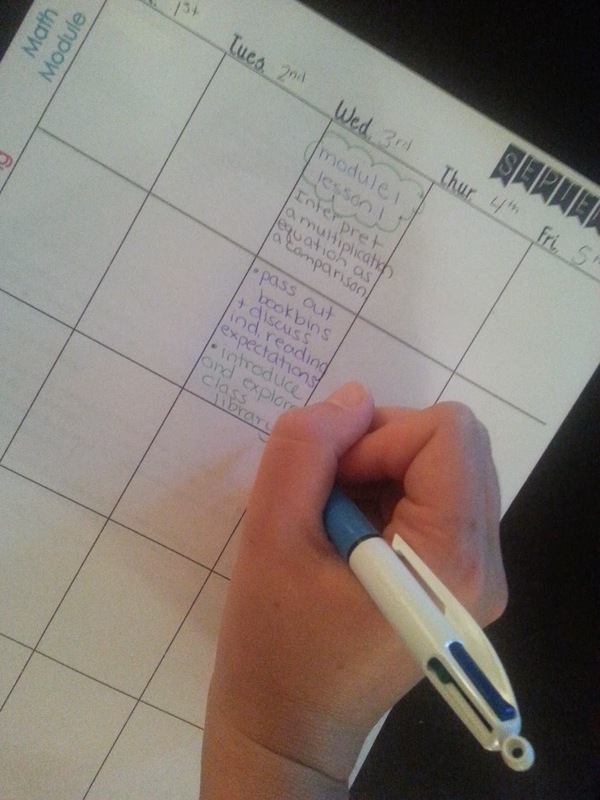 I love creating lesson plans that are cute and colorful (for my own simple pleasure). With BIC 4-Color I can have the variety in color I'd like with only 1 pen. This pen comes in basic colors, metallic colors, and in a mini size. BiC Atlantis Comfort and BiC Atlantis Exact are two of my favorite pens because they provide long-lasting ink smoothness and precise-clean lines. Looking for mechanical pencils? 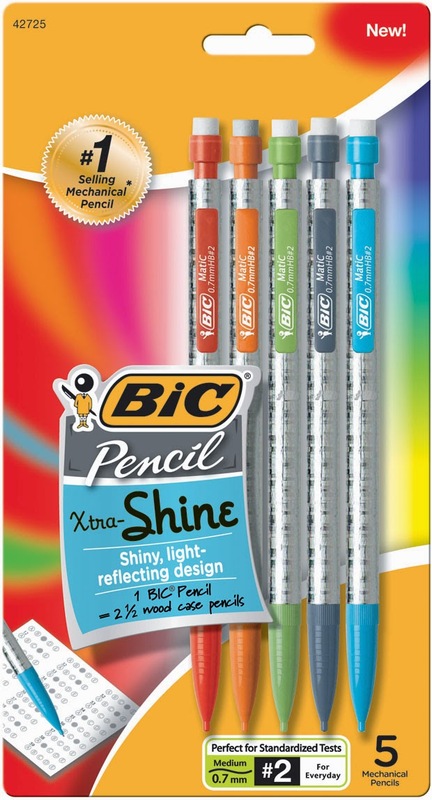 BiC has a new Xtra Shine pencil that contains a fun holographic design. 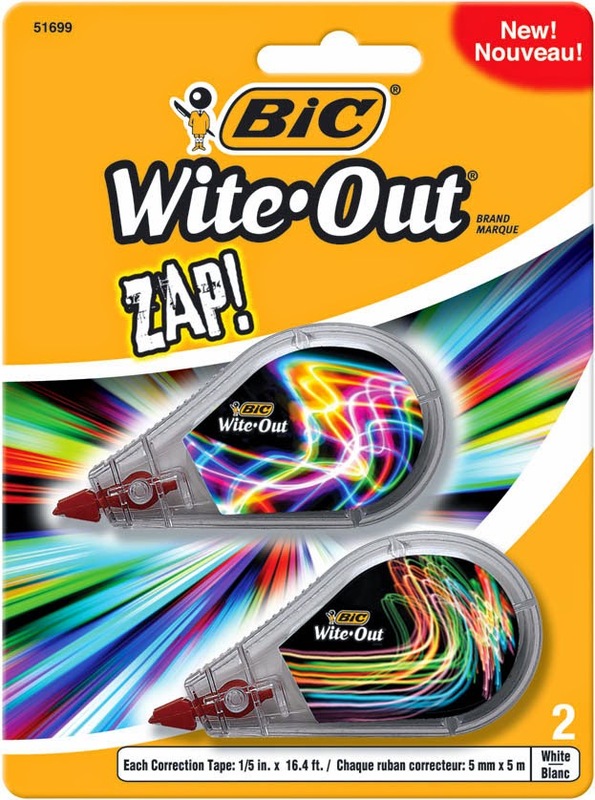 Last but not least, BiC Wite-Out brand Zap! This is a definite must have when you are a teacher. Make a mistake? Zap it out with the convenience of correction tape in trendy neon designs. 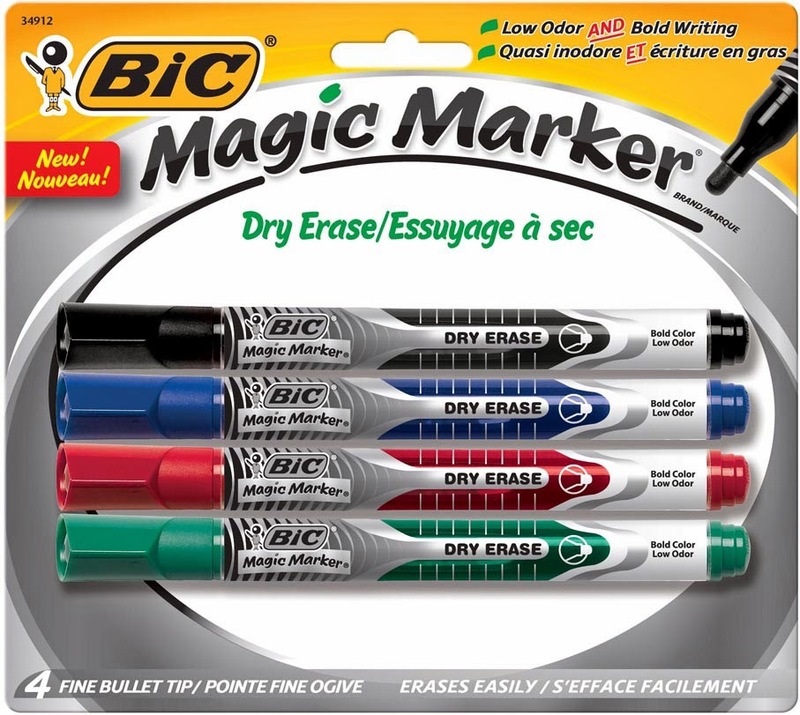 Want to add some new BiC items to your classroom supplies? Want to try out BiC's new line? Well your in luck! BiC has offered to giveaway 1 of their back-to-school product sets to one lucky reader. Enter the Rafflecopter below for your chance to win. (U.S. only, 18+ please). The count down to my first day of school has begun. Check back in a few weeks to see how I am using all these great BiC products in my classroom. From writing my lesson plans to letting the kiddies explore the various writing tools/colors during independent writing the possibilities are endless! 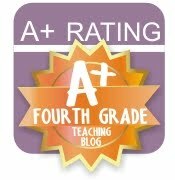 I am a math intervention teacher at a K-5 building. I can definitely see using the multi-colored pens to unpack word problems. One color to circle the important information, another color to underline the question and a third color to note missing information in a multi-step problem! We still teach cursive and handwriting skills. There will always be a need for writing no matter how prevalent keyboarding may become. Having fun, cool writing utensils is one way to make writing COOL and modern! I LOVE Bic products; they are always innovative and fun and especially reliable. I think these pens would be amazing during Writer's Workshop to do editing. 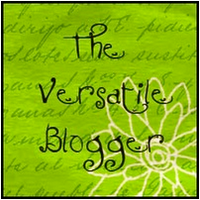 Plus, the kids would love to use them to do cursive, as mentioned by the above bloggers. I didn't know about the BIC dry erase markers - I'll have to check those out. Personally, I love writing in different colors so I would use them a lot. For the kids: writing workshop (peer editing), ELA, dry erase markers for writers' workshop & math. My students will be enthused to have new writing utensils. I would use them for planning, grading, and student writing. I'm going to let my students write their pieces in pen. I'm also going to use these pens as birthday gifts to them. I would use them for writing in journals, writing papers, and editing in the different colors. I remember having a multi colored pen when I was a kid, but I didn't know they still made them. I would definitely have my kiddos use them for spelling to do rainbow words. I LOVE the white out tape (I frequently need to cover up my mistakes), and I am totally excited that they have a new neon design. 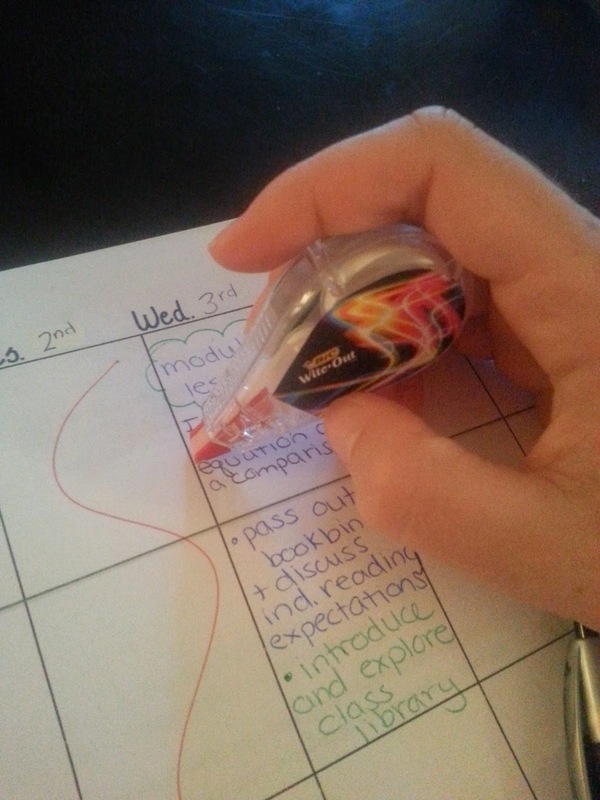 I would also use the personalization pens to motivate my students to write with the pen that they customized, and like you said it would make my life so much easier to know who the owner of any pens that are just lying around. I have a few kiddos who are having a lot of trouble holding writing tools (pencils, crayons, pens, markers) and having these with the special grips would help so much!! Woot! Woot! So excited to receive these products! 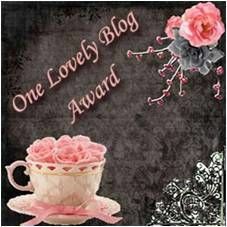 Thanks so much!!!!! !